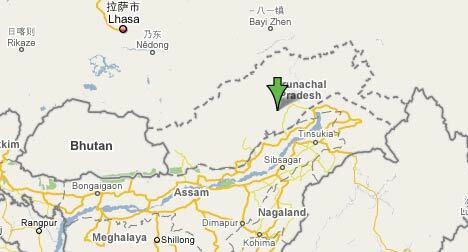 Arunachal Pradesh: Indian or Chinese in Google Earth? This blog has tracked a good number of stories coming from the more shrill corners of the media in certain countries, purporting to prove how Google’s choice of borders for Earth and Maps is meant to show an intentional slight when the choice goes against their wishes. Such stories have mainly served to show how Google Earth has entered the public consciousness as a reference for such information. It has become important to set the Google record straight. That doesn’t mean such stories can never have a justified complaint. As this piece by the Telegraph in Calcutta points out, Google Earth shows the Indian state of Arunachal Pradesh as being administered by China but claimed by India. The situation on the ground, however, is pretty much the reverse: Most of it is controlled by India, though the Chinese lay a claim to it. Strictly speaking, from a neutral perspective, the Maps view is correct. For Google Earth, this would translate to both borders being colored red, perhaps with an orange border depicting the line of control. But is this coloring intentional? I doubt it. Search for “Arunachal Pradesh” in Google Earth and you will scroll to a location tagged “Arunachal Pradesh India” by Google’s own database. That’s hardly siding with the Chinese. I couldn’t find any actual reference maps based on FIPS, so I can’t tell if in the case of Arunachal Pradesh Google made a mistake. One possibility is that the US officially agrees with China on its claim to Arunachal Pradesh, much in the same way that the US officially agrees with China that Taiwan is part of the People’s Republic. Aargh! The US DOES NOT agree that Taiwan is part of the PRC. Its official position is that the status of Taiwan is undecided, and has been since the 1951 San Francisco Peace Treaty. That was the open and public position of the US until the Nixon Administration sold out Taiwan. Then it went underground. But as the recent flap over the UN entry shows, it is still the technical official position of the United States. It is likely that Google is getting its data from the ISO, which Taiwan recently sued to get the it to change its position that Taiwan is a province of China, thus changing the definition of Taiwan in thousands of software programs all over the world. Actually Tibet has nothing to do with Arunachal Pradesh. So there is no question of the Tibetans giving the land to India or China refusing to give it. It was never theirs to begin with. In any case Genghis Khan invaded and occupied China and his descendent’s founded what is now “China”. So if anything that entire area which is now so called “China” belongs to Mongolia. The so called “Chinese” should stick to making fried rice and noodles and not try to pretend to be anyone other than Genghis Khan’s illegitimate children. Stefan, Mongol descendant Babur occupied India. So, India belongs to Mongolia now? That makes the Indians, the illegitimate Mongol children, Chinese step sibling. Arunachal is part of India. There is no meaning of red lines. Earlier this week, as part of a routine update to Google Earth, we published new data for the Arunachal Pradesh region that changed the depiction of certain place names in the product. The change was a result of a mistake in our processing of new map data .We are in the process of reverting the data to its previous state, and expect the change to be visible in the product shortly. We would like to clarify that this issue did not impact our depiction of international borders. there should be no dispute over boundries between india and china. arunachal pradesh is part of india and it will.indian government should not allow such google maps in india when we have bhuvan maps.